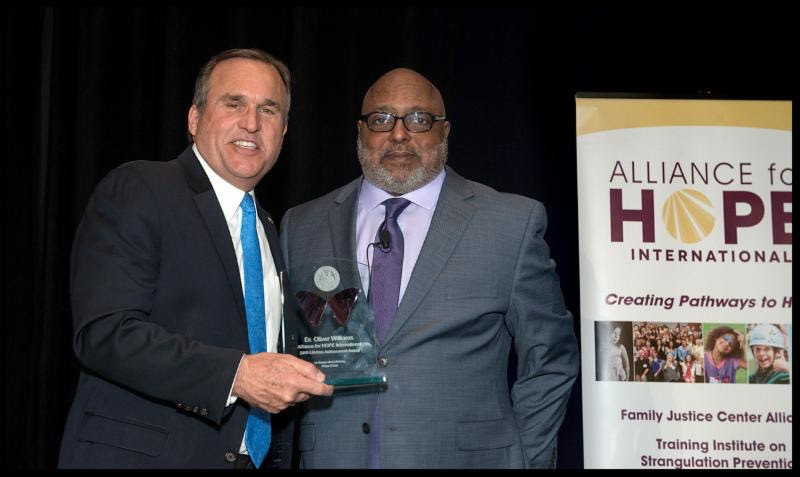 Alliance for HOPE International President Casey Gwinn presented Oliver Williams with the Lifetime Achievement Award at the 18th Annual International Family Justice Center Conference in Forth Worth, Texas. Oliver Williams, the founder of the Institute on Domestic Violence in the African American Community (IDVAAC), received the 2018 Alliance for HOPE International Lifetime Achievement Award in Fort Worth, Texas on April 25, 2018. “Oliver Williams has changed the world for thousands of victims and offenders in the course of his amazing career. He is without a doubt one of the most transformational leaders we have ever worked with,” said Alliance President Casey Gwinn. Williams is a professor of School of Social Work at the University of Minnesota-Twin Cities. He was the Executive Director of the Institute on Domestic Violence in the African American Community (IDVAAC) from June 1994 to September 2016 and served as the project director of the African Immigrant and Domestic Violence Initiative from 2010 to 2016 and the Safe Return Initiative that addressed prisoner reentry and domestic violence from 2003-2016. Currently, he directs the African American Domestic Peace Project that works with community leaders in 12 cities across the United States. Williams has worked in the field of domestic violence for more than thirty-five years. He is a clinical practitioner, working in mental health, family therapy, substance abuse, child welfare, delinquency, domestic violence and sexual assault programs. He has worked in battered women’s shelters, developed curricula for batterers’ intervention programs, and facilitated counseling groups. He has provided training across the United States and abroad on research and service-delivery surrounding partner abuse. Currently he is a consultant with the Education for Critical Thinking and an advisor with Domestic Violence Shelters.org. He has been appointed to several national advisory committees and task forces from the Center for Disease Control, U.S. Department of Justice, Office on Violence Against Women, U.S. Office on Women’s Health, and the U.S. Department of Education. He has been a board member of various domestic violence and human service organization including the early days of the National Domestic Violence Hotline (1999-2000) and the Alliance for HOPE International Advisory Board from 2006 to 2016. In 2000, he was appointed to the National Advisory Council on Domestic Violence by the U.S. Secretary of Health and Human Services and U.S. Attorney General. In 2010, he hosted a roundtable on youth and violence for the U.S. Attorney General. He also participated in a roundtable with the U.S. Attorney General on issues related to fatherhood and participated in a White House Roundtable on Fatherhood and Domestic Violence. He has conducted training for military Family Advocacy programs in the United States and abroad. He has presented to numerous Family Violence, Research and Practice organizations in the United States, Kenya, Canada, the Virgin Islands, the United Kingdom and Germany. In 2015, he was invited to speak at the United Nations about domestic violence among Africans in the United States and in Africa. His research and publications in scholarly journals, books, reports and DVDs have centered on creating service delivery strategies to reduce violent behavior and support victims of abuse. He has consulted with the NFL, MLB, and the NBA on issues related to domestic violence. “Shelia Wellstone Institute Award” related to his national work on Domestic Violence and a Distinguished Alumni Award from the University of Pittsburgh, School of Social Work. Dr. Williams received a bachelor’s degree in social work from Michigan State University; a Masters in Social Work from Western Michigan University; a Master’s in Public Health and a PH.D in Social Work both from the University of Pittsburgh. Alliance for HOPE International is one of the leading systems and social change organizations in the country focused on creating innovative, collaborative, trauma-informed approaches to meeting the needs of survivors of domestic violence and sexual assault and their children. Alliance for HOPE International and its allied Centers serve more than 150,000 survivors of domestic violence and sexual assault and their children each year in the United States. The Alliance supports multi-agency Centers in more than ten countries and trains more than 10,000 multi-disciplinary professionals every year. Alliance for HOPE International operates the Family Justice Center Alliance, the Training Institute on Strangulation Prevention, Camp HOPE America, the Justice Legal Network, and the VOICES Survivor Network. The Alliance was launched by the founders of the San Diego Family Justice Center after the development of the President’s Family Justice Center Initiative in 2004. At the request of the U.S. Department of Justice, the team was asked to develop a program to support new and developing Family Justice Centers across the country. There are currently more than 130 operational Centers in the United States with international Centers in more than twenty countries. There are over 100 Centers currently developing in the United States, Europe, the Middle East, and Central America.